The temporary traffic lights have actually gone from the road works by the new visitor centre. We are driving on brand new tarmac around a brand new roundabout and a brand new roadway has opened up towards Larkhill. Along the A344 the first cut of hay has left the fields striped a pale green. Hundreds of black plastic wrapped balls dot the landscape. 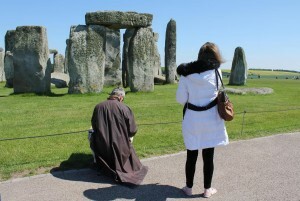 The Stonehenge car park is expansive today. Cars cover the adjacent field that acts as the overflow during the busy months. An annoying whine fills the air as a remote controlled boomerang is flown around. 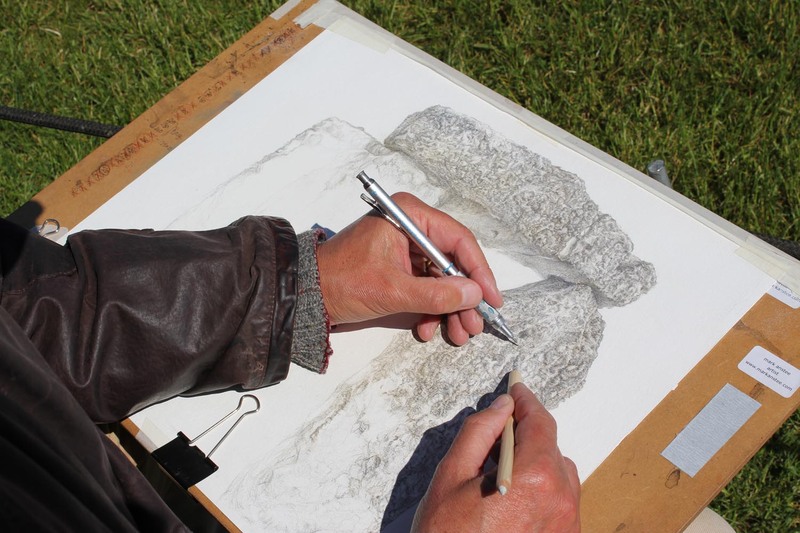 On to the tarmac path and Mark opens his stool next to the guide rope and begins another session on the silverpoint trilithon. It isn’t nearly as busy up here in the monument field as the car park would suggest. Everyone’s pleasantly spaced out along the circular walkway. I guess this is the consequence of having individual travellers as opposed to clumps of coach parties here. People instantly start photographing the seated artist but visitors keep a respectful distance and Mark is left alone to get on with the concentrated task of drawing fine details. I take a wander to the grass walkway following a group of four women all listening to audio guides. One of them, dressed in a natty combo of white linen, turns to her friends and says, “How do they even know this?” “I don’t know”, says her friend, “It was like two thousand years ago”. I head for a vacant wooden bench to sit and survey the scene and am joined by a family of three generations, child, mum and her father. “I’ve just sat down and it wants me to go on to number 5”, says the grandfather. “You must have a different one from us because ours are still going”, says the daughter. “Oh look. There’s a lorry full of happy eggs going past”, she says pointing to the A303. A large education group of young people arrive on the grass and have the idea of recreating Stonehenge using bodies. They organise themselves into threes and attempt to build trilithons with two people holding someone planking above their heads with mixed results. They swiftly abandon this plan and go for another picture opportunity with five boys lining up with their arms outstretched while another takes an almighty run-up, and with an impressive leap, twists and lands accurately on the platform of arms. These guys are having the best time here. I wander amongst the International visitors and between conversations in German and Italian, Japanese, Cantonese, Spanish and some of the Indian languages. 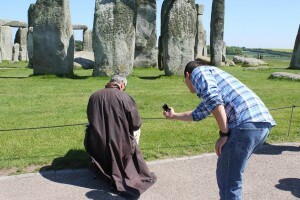 As ever, the world has come to Stonehenge and seems to be having a nice day. I reach the low metal bridge that protects the Neolithic Avenue from destruction by the trampling of a million feet and realise the ropes and netting have all but gone. How weird! How nice! It all feels remarkably open. I seem to remember some time back last summer there didn’t used to be all the netting along here but I can’t recall when it changed. Anyway, this feels like a new experience again, and people are behaving differently along here; they’re not bunching up, they’re walking. Outside along the road, a van drives past hooting in a rhythmic beep-be-be-beep beep-be-be-beep. It’s obviously amusing the driver. I leave Mark to continue his work and head back to the truck. People are picnicking in the field, blankets spread on the grass amongst the parked cars. Up on the byway several vehicles are lined up and several tents pitched. Among them is the yellow bus we’ve seen over the year, and as I tune in, I can hear the Stonehenge drummer taking the stage in the tent that houses his kit. Today at least, he has an audience.